True to its status as an agri-business, marine and aquatic institution, a school in Southern Philippines has explored one of the many benefits of seaweed by converting it to an organic foliar fertilizer. Developed by the Southern Philippines Agri-Business and Marine and Aquatic School of Technology (SPAMAST), the fertilizer is derived from the drippings of Kappaphycus alvarezii, a species of red alga. Kappaphycus Drippings or KD Foliar Fertilizer, which is 100% organic, has proven to increase the yield of rice, baby corn, soybean, mungbean, sweet pepper, cauliflower, mango, pechay, and orchid. The fertilizer has proven to promote enhanced growth in terms of height and diameter as well as enhance seed germination. When used for pechay, it increased the number of its leaves and leaf area index. A kilo of Kappaphycus seaweed can yield up to 650ml liquid fertilizer. It contains nutrients that contribute to soil fertility, including nitrogen, phosphorous, potassium, calcium, magnesium, copper, zinc, iron and manganese. The recommended rate of application is 20ml of KD per liter of water, which can be sprayed directly and generously to the plant early in the morning or late in the afternoon. Drippings of the Kappaphycus seaweed contain nutrients that contribute to soil fertility, including nitrogen, phosphorus, potassium, calcium, magnesium, copper, zinc, iron, and manganese. Foliar fertilizers are directly applied on the plant’s leaves, which absorb nutrients through its stomata and epidermis. 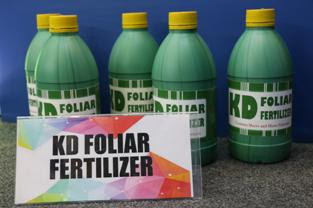 “KD Foliar Fertilizer can provide fisherfolk with additional livelihood,” Graciella Caballero of SPAMAST said. “With a kilo of seaweed, a large plastic bag, and direct sunlight, a fisherfolk can generate 650ml of liquid fertilizer, which can be sold for P75 a liter,” Caballero added. SPAMAST is a member of the Southern Mindanao Agriculture, Aquatic and Natural Resources Research and Development Consortium (SMAARRDEC), one of the consortia established by the Philippine Council for Agriculture, Aquatic and Natural Resources Research and Development of the Department of Science and Technology (DOST-PCAARRD). The KD Foliar Fertilizer technology is one of those on display at the Davao Agriculture Trade Expo (DATE). Geared towards the development of the agriculture industry in Davao Region, the three-day event is held from September 22-24, 2016 at SMX, SM Lanang Premier. DATE 2016 features Mindanao’s golden crops and is packaged to cover the basic aspects of a successful agriculture extending beyond production to cover financing, processing, marketing, and even exporting. DATE 2016 also highlights the first ever-agri marketing conference on Sept 23 to provide a venue for business matching and networking and to link agri-traders, businessmen, and consumers.